Take boiled potatoes and mash it. Add carrot, peas, salt, red chilly powder, turmeric powder, garam masala, ginger paste, green chillies, lemon juice, and mix it well. Sprinkle some water on bread slice, mash it and add to potato mixture or add corn flour and mix it well. Make four patties and roll it in bread crumbs. Take oil in pan and heat oil. Shallow fry all the patties. Soak lettuce/cabbage leaves in water for 10-15 minutes. Add some salt in the water. Drain water after 10-15 minutes. This will slightly soften the leaves and salt gives a nice taste. Take buns and cut into half horizontally. Toast the half buns into butter. Apply tomato ketchup and green chutney on both the sides. 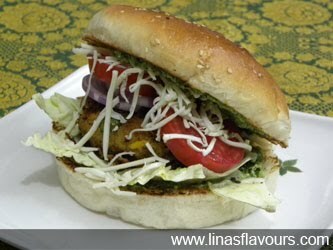 On one bun, arrange cabbage leaves, 1 patty, 3-4 onion slices, 3-4 tomato slices, sprinkle some cheese and cover it with another half bun. You can add mustard sauce if you like it.